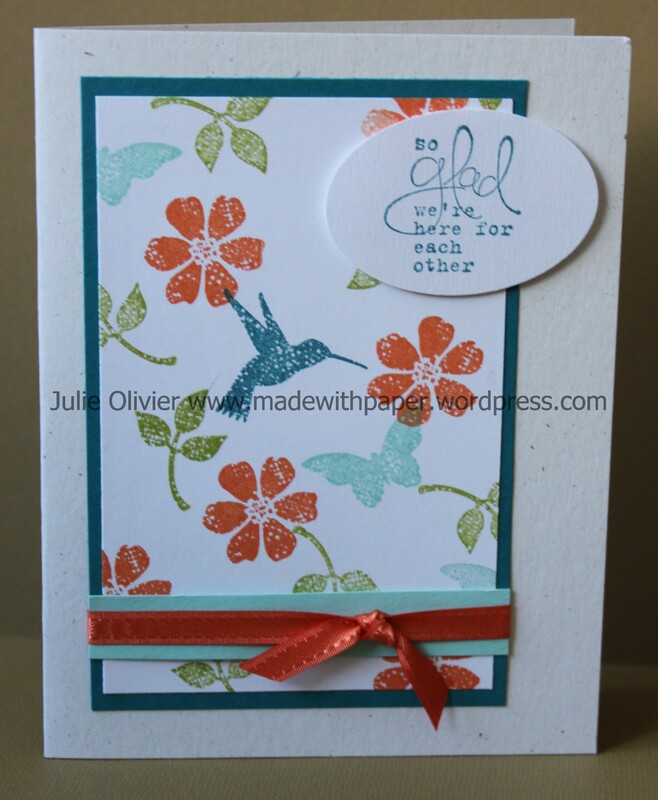 This is another card that I made with the Blooming Marvelous stamp set (one of the Sale-a-bration set!). 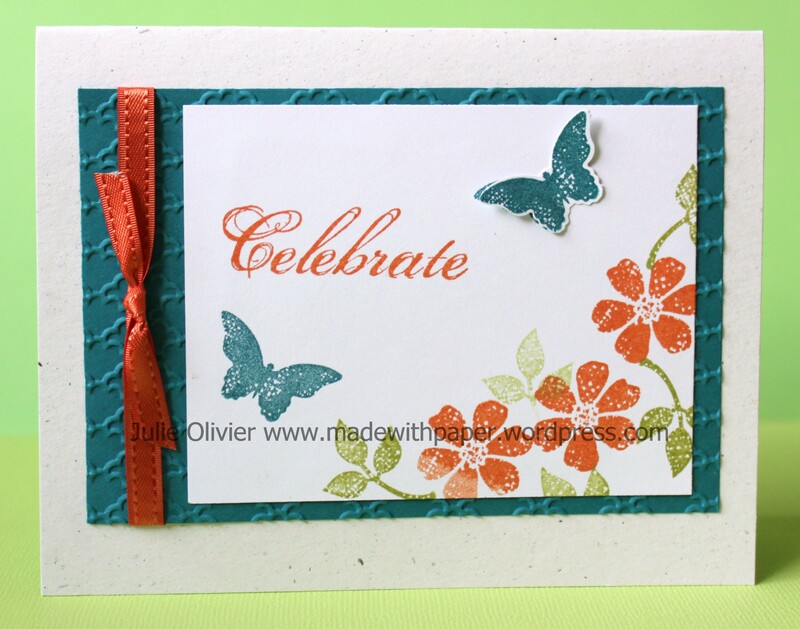 I also used the greeting “Celebrate” from the “Feeling Sentimental” stamp set (another Sale-a-bration set!). This card has a real “Spring” feel! The new Bitty Butterfly punch fits perfectly with the butterfly stamp in that set. I used it to make a “raised” butterfly. I think it really adds to the card by creating more dimensions. The Fancy Fan embossing in the background also complements the texture. At the corner of Madison Avenue and Sycamore Street !!! Here’s a card that combines Madison Avenue Sale-a-bration stamp set and Sycamore Avenue Sale-a-bration designer series paper. You still have another 18 days to make your order and get these products for free during Sale-a-bration!!! I also used the really nice Sale-a-bration ribbon! It’s a very simple card with no tools necessary! No Big Shot and no punch. Anybody can make it! 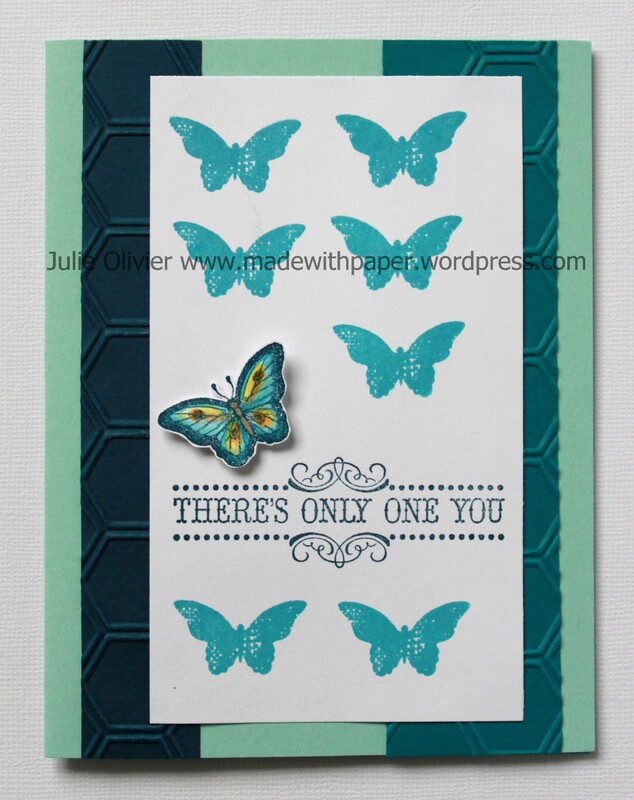 For today’s card, I used 2 Sale-a-bration sets: Vintage Verse (There’s only one you) and Bloomin’ Marvelous (the Turquoise butterfly). The other butterfly is from the “Papillon Potpourri” set, that I really like too! You can now get the smaller butterfly punch that coordinate with both the Papillon Potpourri and Bloomin’ Marvelous. (It’s called “Bitty Butterfly”.) I wanted to make the butterfly really stand out, to go with the greeting “There’s only one you”. I stamped it in Midnight Muse ink and colored it with the Markers. It’s raised with a dimensional to make it “pop” even more. In the background, I used the new Honeycomb embossing folder. Only one week left before Sale-a-bration starts!!! Only one week left before Sale-a-bration starts!!! Sale-a-bration is the best time of the year because so much free products are given away!!! All week, I will post card samples that I made with the Sale-a-bration stamp sets, that you can get for free for every $60 you spend!!! 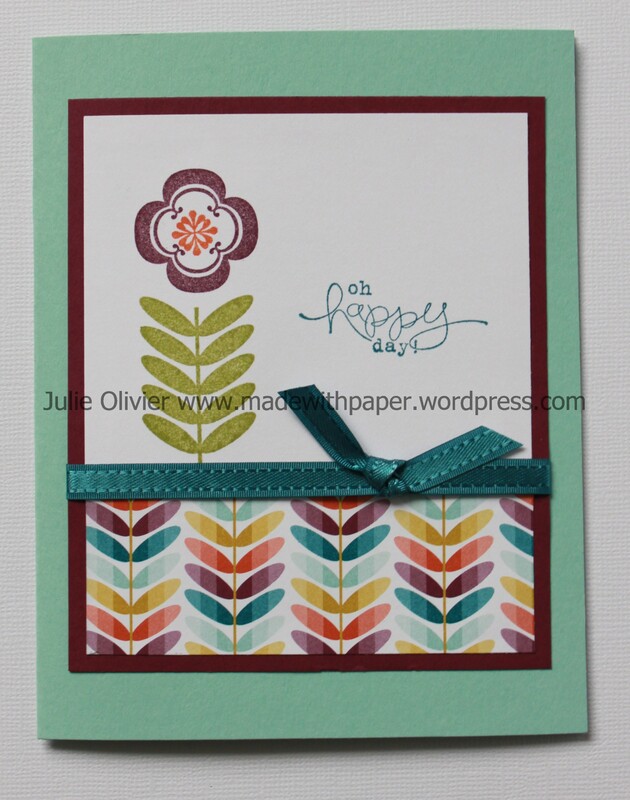 This card was made using the Bloomin’ Marvelous stamp set. It’s one of my favorite set! I love hummingbirds and flowers (maybe you already know that by checking my latest Paper Art frames!) so I guess it’s no surprise that I like that one!!! I also like that it comes with 4 images and 4 greetings. It makes it a very versatile set! I used the 1″ Square punch and the Postage Stamp punch to make the postage stamps for this card. 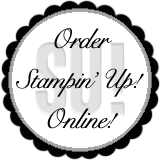 I first stamped the image on Whisper White card stock and cut it with the 1″square punch. Then, I sponged the each side with Pool Party ink, so you would see the side borders when put over the Postage Stamp punch. 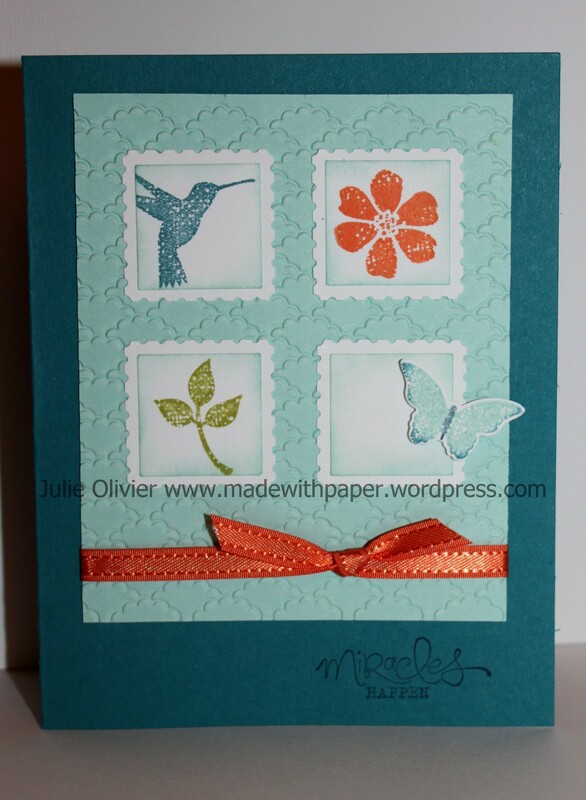 I wanted the butterfly to come out of the stamp like it’s flying away and I thought that it would be perfect with the saying “Miracles happen”… I used the new Bitty Butterfly punch (in the mini-occasion catalogue on p.13) to cut the butterfly. Much faster than cutting it by hands!!! I love that it also coordinates with the “Papillon Potpourri” stamp set! The ribbon is also from the Sale-a-bration free products. It comes as a bundle that includes 3 ribbon spools and 36 buttons, also in 3 colors!